One of the best things about having a Home Based Business, sometimes known as a cottage industry, is that you have the opportunity to enrich your life and the lives of your children by including them in your business endeavors. 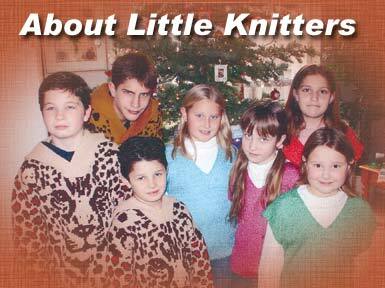 Some of "The Little Knitters" of today are the Grand children of David and Sharon Nani, owners of the home based business: The Knit Tree . The prosperity of our future rides in our youth of today. Sharon's belief in this statement and her love of the knitting craft led her to work with various educational programs for our youth though out her career. This involved helping to set up knitting machine programs ranging from career days for Grade School students interested in the fashion programs, ROP programs in high school home ec classes, continuation schools, home schooling programs, and adult education at Shasta Community College. Creative, Business, and Personal Skills for the Future! 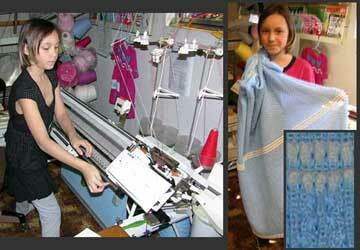 Little Knitter designs, knits and learns knitting cottage industry business for her senior project. It is quite natural that these opportunities are also presented to Sharon's family. The "Three Generation Slipper" program was the perfect knit item to turn over to "The Little Knitters" as their own personal endeavor. Sharon started knitting and selling this slipper in 1970. By 1980's David and Sharon's children, Deborah and Ken took over the slipper program. 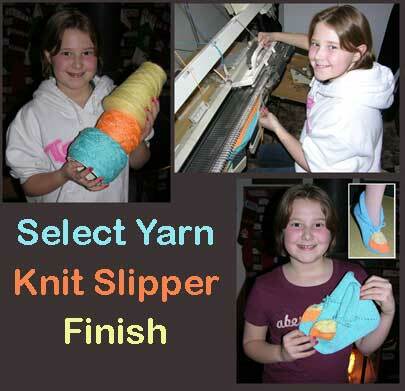 From then on, this knit slipper project became part of "The Little Knitter's Program teaching them business skills as well as learning and appreciating the rewards that come with creating products by hand. Ken liked the knitting loom  his friends were quite impressed as they "timed" him at how quickly and efficiently he operated the knitting loom as the slippers rolled off. But that's the only part he liked. So, Debbie took over from there and handled all the assembly, packaging, marketing, and bookkeeping for their little business. 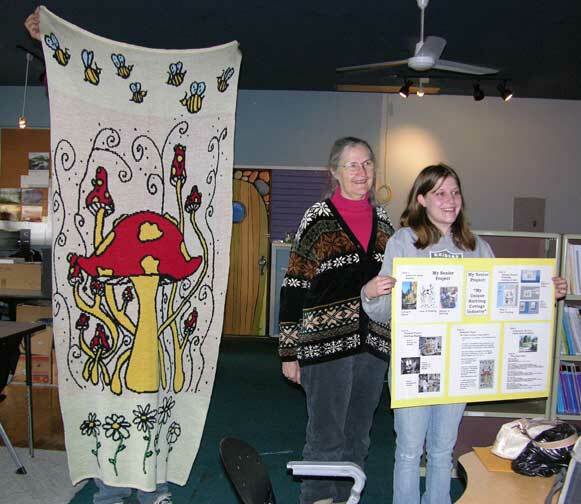 They both not only learned "team work," but they developed several personal and business skills learning to run their own little business as part of The Knit Tree. Today, Ken has his own Cottage Industry: Custom Wood and Land Works, where he makes creative wood products from milling the tree with an Alaska Saw Mill to turning it into unique hand crafted products and artful storage sheds. Deborah is a successful executive in a well known financial organization showing how her organizational and marketing skills paid off. The skills they learned as children contributed to their endeavors of today. The attributes of accepting responsibility, meeting a commitment, dealing with people in an honest and respectful manner, and working as a team for the welfare of the family are things children must learn at an early stage in order to carry these qualities into adulthood! 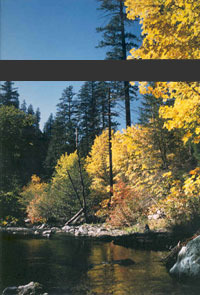 Caption for image on the left side. Presently, the third generation of Little Knitters are knitting these slippers.&nbsp; The knitting classes for children are not just about knitting and earning extra spending money! &nbsp;It's about developing the self confidence, personal, and business skills to become a responsible adult in today's society. There are definite "prerequisites" in order to participate. 1) School grades and extra curricular programs must be kept up to the best ability of each individual. 2) They are encouraged to put half of all their earnings in a Savings Account. 3) Each item is inspected by an adult to ensure that it is made with professionalism and excellent quality which instills pride in every knit product offered to you by "The Little Knitters." Commumities encourage children to participate in Community Events such as Art and Craft Fairs by giving them a free table to exhibit or sell the hand crafted items.Turtle Bay in our community sponsors an Art and Craft Fair every Fall and encourages the creative education of our youth. 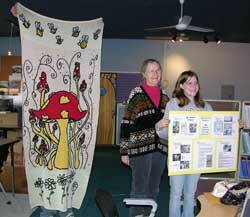 Our Little Knitters enjoy attending these Art Festivals and are proud to show the knit items they have made. Look for these events in your community. Please encourage our "Little Knitters" of today by purchasing a pair of their Slippers, knit baby blankets, knit baby hats, knit baby booties, hand painting Austism Heart puzzle on knits and much more.